Look at that EYE-POPPING pic of His Royal DIAOness on the poster for OPUS 2 JAY in Singapore on 8 November 2014 at the new National Stadium! So much better than last year's, right?? So the ticketing has been officially announced and as usual, there will be priority booking for OCBC Cardmembers from 25 to 27 April. “After a successful world tour comprising of packed arenas in Taiwan, Hong Kong, China and including 3 spectacular sold-out shows in Singapore last June, Asia’s reigning King of Mandopop brings his first full scale outdoor Singapore concert to the National Stadium at the Singapore Sports Hub, the nation’s newest and largest concert arena on 8 November 2014 (Saturday). Jay Chou solidified his status as pop and R & B King as fans snapped up much sought after concert tickets within a few hours of ticket launch for his previous concerts. 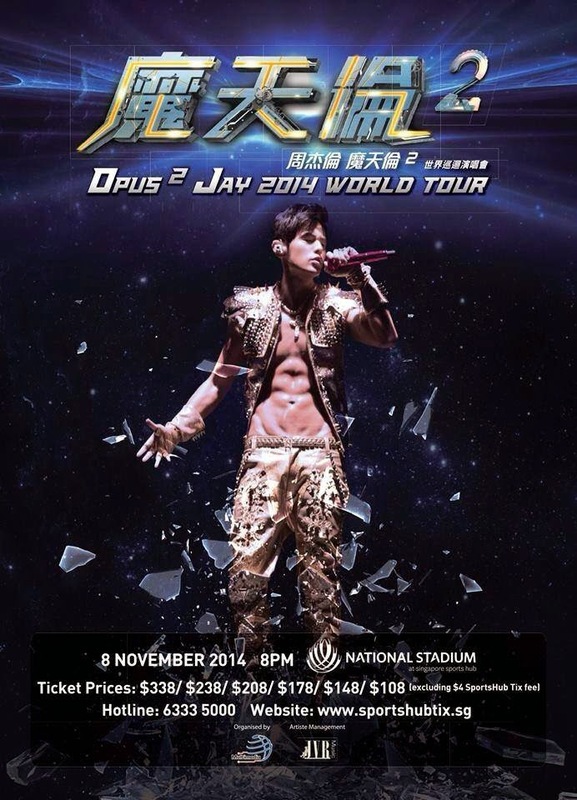 OPUS 2 JAY 2014 WORLD TOUR is a continuation of Jay’s last concert with a fresh opening performance. The concert will be stocked with razzle-dazzle projections and lighting effects as Jay Chou performs songs from his forthcoming 2014 album and familiar fan favourites. Along with skilled dancers, ace musicians, giant video screens, spectacular stage, complemented by the National Stadium’s modern appearance, OPUS 2 JAY 2014 WORLD TOUR Concert will be a sight to behold. Fans can look forward to an unforgettable world class concert experience! From past years' experience, the priority bookings will move SUPER FAST, leaving little for the rest. As such, it would make sense to get hold of an OCBC cardholder (if you are not already one) to help or quickly apply for one yourself to take advantage of this situation. Of course, the capacity of the new stadium will be bigger and the organisers are targeting 30,000 pax. But recalling last year's OPUS JAY in June, when he sold out three nights, each about 7000 to 8000 pax, in 5 hours altogether, it seems fairly certain that: the same mad rush is going to happen come 25 April. It also seems equally certain that the website is going to crash once sales start, so I hope the new agent has put into place measures to handle the humongous volume which is bound to come its way. I'm not sure about priority for other sponsors and will update on the Page and this blog accordingly when I hear any other news. Hi Jan, may I know how is ocbc priority when normal ticketing sales oso starts at 25th? I think it means you can only pay using an OCBC card from 25 to 27 April. As in, there will not be any other options for payment when you log in to buy. Awesome! Just a little over six months more! i'm from indonesia. any available seat now ? hi any website to recommend for buying his shirt? I'm letting go 1 pair of tickets. Section PF1, Row 11, VIP seats. Anyone interested? Can text me at 91225252.